A few of my friends and I get together on the semi-reg for Nerd Nights, in which we build a blanket fort in my living room, project Star Wars movies on the wall and eat themed food. Last May the Fourth, we had some delicious pulled bantha meat and womp rat skewers. We always play the mustache game during the movies, in which we each place a paper mustache on the screen. When a character lines up with it, we giggle maniacally and take a drink. We are nerds, and we have fun. A Star Wars party, we had. A few weeks ago, I gathered with my geekiest friends to watch Star Wars. It was May the Fourth, and we had ourselves a little party with themed food and favors. Because that’s what geeks do. 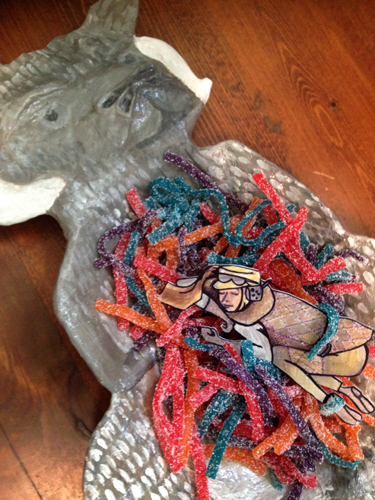 I thought maybe I’d try to do a tutorial on how to make your own tauntaun gummy worm tray… but all the in-progress shots turned out blurry and dark, so I’d have to draw it, and that could take a while. So don’t hold your breath for that… I’ve got other stuff a-brewing too— a new travel map is in the works— I went to San Francisco y’all! 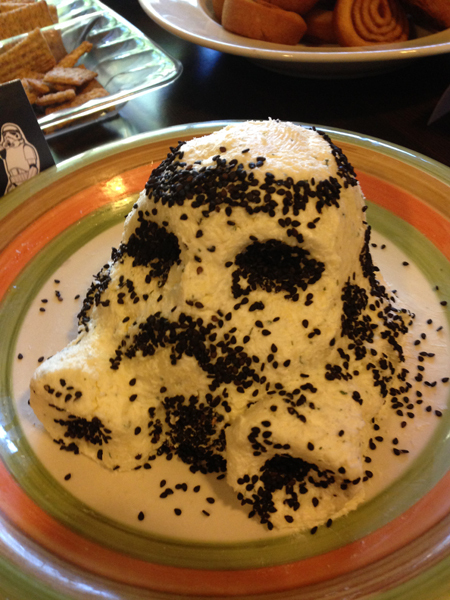 I also made a pretty awesome Stormtrooper Cheeseball. I got the idea from this food blog. She used black olives for her markings, but I do not like olives, so I bought black sesame seeds instead. Fancy… though a bit imprecise in their placement and difficult to manage. We also had Tatooweenies in Blankets, 7-Leia Dip, Princess Leia’s Buns, Carbonite Crackers, and Yoda Soda (adult recipe). There were also balloon light sabers. Yah.